Our print finishing options can add a custom look to our standard products or enhance your unique design. A print finishing technique with dramatic results. We offer a range of foil options from flat color to ultra-shiny metallics. Our foiling process can accommodate both flat stamping and foil embossing. Give your project a true texture by incorporating an embossment. We can emboss areas up to 11×17. We also offer a range of embossing options including 2 level embossments. If you want the opposite look of an embossment, we also provide debossing options. Keep in mind, you will automatically get a debossing effect on the reverse side of your embossed pages. UV coating creates an ultra-shiny surface for an even more eye-catching effect. This process is basically a liquid varnish that coats the page and protects your artwork from scratches. Spot UV services coming soon. You may need your project to fold, and we have you covered. 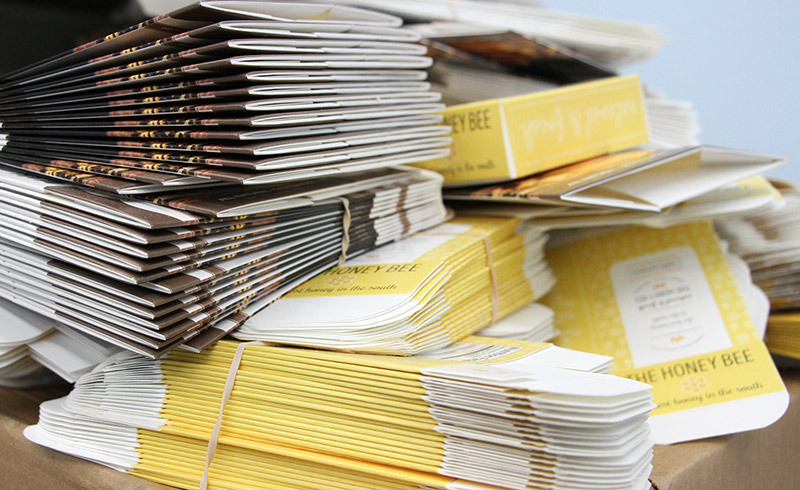 From pocket folders to packaging, we have a solution for even the most complex designs. We also offer scoring services to clients that want to fold their own projects on demand. Need a unique shape? Want to punch a hole through your artwork? We can handle those requests, too. We offer die cut services up to 11×17. What booklet would be complete without stitching? Every pocket folder needs glued pockets. We provide full bindery services for projects big and small. At Suncoast Identification Solutions, we offer a wide range of print finishing specialties, so you can customize your project and wow your customers. The possibilities are endless — whether you’re in search of a unique folding design, an eye-catching shape, texture or even shiny, protective UV coating. A quality print finish will distinguish your product and company from the rest, and our expert design and print team is here to turn your next print project into a work of art. Gotta See It First? We Have Samples For You. We have dozens of textures, materials, colors and print finishing solutions that give you a nearly endless supply of style combinations. Which one is right for your products or business? Request a sample and find out. Suncoast Identification Solutions is your one-stop shop for print finishing services, customization, packaging and so much more. Customer service is our top priority, so when you choose us, you know you’ll receive hands-on help with your project from start to finish. Whether you need a complete redesign or just want to enhance your current project with unique print finishes, our team is ready to help you create paper products that are guaranteed to outshine the competition. Contact us to receive a quote and get started.